I have been noticing a beautiful decorating trend lately- gorgeous mirrored walls! I know, I know, when I say mirrored walls, some of us automatically think of the big 1970’s trend and we cringe a little, and some cringe a lot (if we’re old enough to remember). I know that even some of you may have gone to great (not to mention expensive) lengths to remove that trend from an older home, but don’t run away yet, stick with me on this, I promise, it’s different this go ’round! It seems like every designer blog or decorating magazine that I have looked at this month has at least one room with a wall (or part of a wall) that is mirrored in some sort of various way. These walls that I am seeing are absolutely FANTASTIC! What a great way to make a huge decorating impact, not only by increasing the light and size of the room, but what a fairly inexpensive way (compared to expensive art or a large piece of furniture to fill the space) to really update a room no matter what your decorating style is. Take a look (click on the picture for a more detailed look).. This wall directly above is just two mirrored panels hung top and bottom! Notice in the middle of the two panels that the half circles put together made a big circle and really pop! Brilliant! How easy is THAT! I looks like (above picture) that they put the mirrored tiles on the wall and simply hung an empty ornate frame to outline the mirror tiles on the wall behind! Wow! Above, check out the wall to the left! 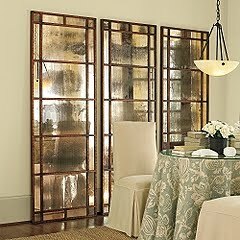 Looks like vintage or antique mirrored panels pieced together. Here’s the difference this go ’round on this trend versus the ’70’s, the mirrored wall is not displayed alone and blah and boring huge piece of mirror. 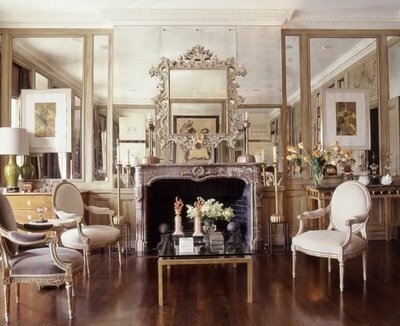 Today, these mirrored walls are either distressed, or antique mirror tiles that have been pieced together, or they have molding or lattice-like design work over them to break up the solid mirror look. 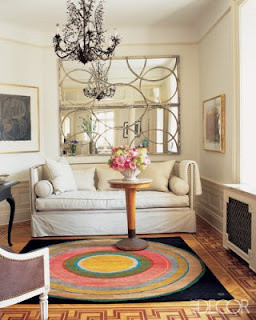 I love the arched mirrror above! These large floor mirrors can always be hung on the wall too! So when you see those mirrored panels around in the stores and catalogs (especially Ballard Designs and Home Decorators online), look at them a little differently and think about the possibility of hanging several or more together for a great impact. 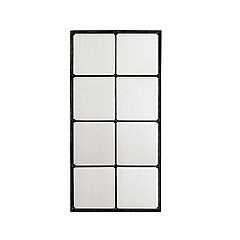 Also, if you like the idea of doing a mirrored wall with the trim overlay, I noticed that Lowe’s and Home Depot have the large mirrors for the walls. 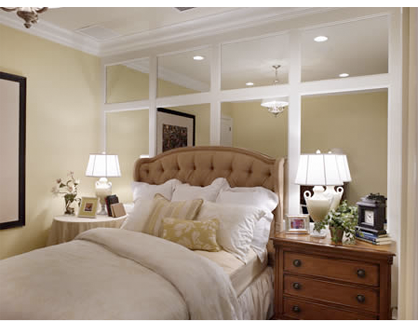 If you would rather have someone else do it, you can call your local glass and mirror store for a large continuous wall mirror and they should have a contact for trim work to place over the mirror (they may even do trim work). You can always do it yourself too if your comfortable with cutting molding. I think I’m going to do a little alcove with decorative mirrors in my living room in the next couple weeks, I’ll post pictures when it’s finished. That’s it for now, some fun crafty stuff for you next week! Thank you again for you comments and emails! Mirrors, can be naughty in the bed room.. be careful. Wow, what a stinking cool idea. I hate to use the word stinkin twice in one day but it just came out that way. I have a dining room that I have been struggling with. It's on the north side of the house with a deep porch over hang and it's just plain dark. 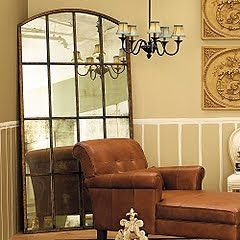 I'm not liking the dining room so I though propping or hanging two large mirrors would help but the wall with mirrors . . . hmmmm. LOVE this idea! I want to do this in my bedroom!! I have a small town house in Newport Beach that has a beautiful view of the golf course and a lake. I currently have one of those 70’s mirrors in my dining room. I’m in the process of remodeling the kitchen, getting rid of the wall between the kitchen and dining room in order to make one big space together with the living room that has 20 ft. ceilings. I hate to get rid of the mirror because it gives the impression of more space, adds more light, and most important, bring the view into the house. I have been looking for ways to update the mirrored wall. I just purchased a home built in 1963. The master bedroom has a wall of solid mirrors. I am old enough to remember the 70’s craze! I am looking for ideas to lighten & brighten. 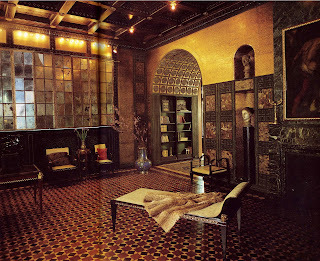 The room is very dark with tone on tone green – not very attractive at this point!